If you're looking for a good time, head to Soho. No, not for anywhere lit by a red light, but for a night at Chotto Matte. This vast Frith Street newcomer takes Japanese-Peruvian fusion (or Nikkei) and really cranks up the volume. On the ground floor is an enormous bar, which on our visit was a seething mass of suits and glamourpusses, all drinking cocktails against a vivid manga-style mural; for the restaurant, go up a floor. Aside from another mural to inject colour, this is a study in industrial prestige: the floors are black (marble), the ceilings are black (paint), the pillars are rough-cast concrete. Attractive staff (in black – what else?) work the floor. Robata chefs tend the grill. The menu offers a spectrum of the two cuisines, though with more Latin flavour than at other Nikkei restaurants. From the Japanese end came exquisite sweet shrimp sashimi; from the Peruvian, a correctly made ceviche: curls of seabass bobbing in a zingy, chilli-spiked marinade, with sweet potato and roasted corn. In between was the fusion fare, including a terrific shrimp tempura (Japanese) with three dipping sauces: one traditional and two Peruvian-themed creations (we liked creamy jalapeño best). The only offbeat combo was grill-marinated (anticucho) pork belly laid on rice (nigiri style), then blow-torched at the table. It had theatre in spades – but this on-the-spot-flaming was more for show than flavour. It’s not the only over-the-top aspect. A trip to the loo is like a challenge from ‘The Crystal Maze’: you’ll need to negotiate two flights of steps; hover in an antechamber debating which door is gents or ladies, press a button to slide back a glass panel, push (hard) to open the heavy cubicle door, then press another button to gain release. Truth is, Chotto Matte won’t be for everyone. If you don’t like loud music, or are a culinary traditionalist, you may find it an affront to the senses. 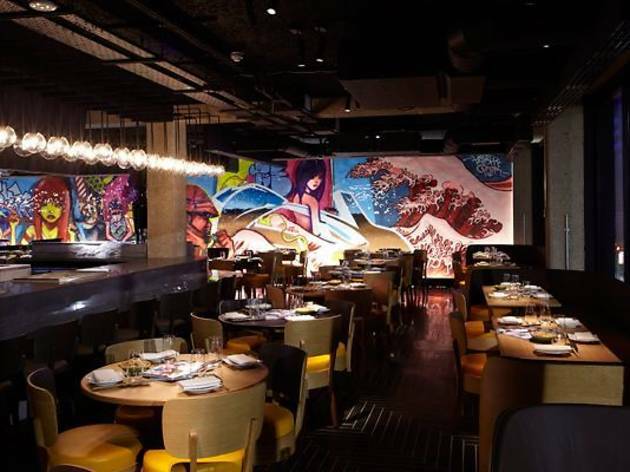 But if you’re after a buzz, glitz and a more affordable taste of Nobu, then you're about to get lucky. Chotto Matte is the sort of restaurant where you’re asked by your waitress, “have you been to Chotto Matte before? No? Would you like me to explain the concept?” I must admit I find this ever so slightly pretentious. It’s 7.30pm on a Tuesday night, I had lunch 7 hours ago and I’m quite peckish, surely the concept is just pick something you like the look of, hopefully enjoy your food and your dinner company, and be on your way. Nevertheless, there is a concept at Chotto Matte, a sharing concept. Don’t get me wrong readers, I’m always up for sharing so you get to try more than one dish, but is it really necessary to call it a concept.. It is located on a buzzy street in Soho and is equally buzzy inside, which is unsurprising given it only opened two weeks ago. The decor is very slick, with lots of mirrors, quirky lighting, dark walls and with upbeat chillout music playing in the background. The crowd is trendy and glamorous. The food is Peruvian/Japanese and the menu is very extensive (3 A4 sides to be precise). It is broken up into sections for cold and hot appetizers, sushi, specialities, etc. but I still found the choice quite overwhelming and felt very reliant upon our waitress to help us put together a wise selection. At this point the service was very attentive so we asked lots of questions and changed our minds a few times, but eventually ordered 15 dishes to share between 6 of us, based on selecting a few dishes from each section of the menu. To drink I ordered a yokatta martini which was delicious but I can’t for the life of me remember what was in it. I tried my friends’ drinks (including a moshi moshi madre) and all were wonderful. The cocktail list is also plentiful. Items arrived as they were ready so inevitably everyone (including me) says “ooh” and “ahh” every time something new arrives. We shared seabass ceviche, miso chicken, black cod, a spicy chicken dish, spicy vegetables, lomo tataki (thin seared beef), beef heart, corn fritters, vegetable tempura, lomo fino (incredible fillet steak), a few gyoza dishes and some sushi. Dishes were presented in a unique way, most notably the corn fritters arrived on a bed of purple crushed potato. The seabass ceviche was great, very lemony, and both chicken dishes were excellent; they were extremely flavoursome and were accompanied by tasty sauces. The black cod was very good as was the beef heart, which was ordered out of curiosity. The lomo fino was superb, not to mention the array of wonderful sauces that it came with; one was made from sharon fruit, one truffles, one yuzu and one was a teryaki type sauce. My overriding thought on the food was that nothing was boring and everything had a strong flavour. By this point things were starting to dwindle service-wise. One or two things we had ordered never turned up and the sushi we received was not what was ordered. They also neglected to bring soy sauce and the essential little bowls to mix soy sauce and wasabi, and only brought them after the third time we asked. Oddly enough, they were unusually keen on replacing dirty plates and napkins with clean ones. We felt they perhaps could have better directed this energy. Despite the service, we were keen to investigate dessert. We shared a peanut parfait, salted, caramel chocolate fondant, praline chocolate mousse and passion fruit brulee, all of which were presented impeccably. I especially loved the passion fruit brulee and chocolate fondant, but all were of a very high standard. The bill came to a whopping £41 each, which, for a Tuesday night and only one drink, is a tad on the extravagant side. Given that Chotto Matte only opened two weeks ago, I’m going to give the service the benefit of the doubt and hope that it improves in the coming weeks. That combined with very tasty food and excellent cocktails suggests Chotto Matte is worth checking out. Very good find. Out of luck and just walked by.... Loved food, especially the desserts. Had the lunch special Bento which was great value. One of the best restaurants tried in London to date! I went for dinner with two friends this November without any expectations, after my disappointment with Coya, I only hoped it would not be the same. And it wasn’t! The food was out of this world, every single morsel was divine and an explosion in your palate in more ways than one. It had just the right amount and balance of spices and flavours. It was faultless and of the highest standard. I would normally not go for pudding but since the meal had been so extraordinary, the three of us decided to go for pudding too and it was amazing! We were left speechless by the food. The drinks list was also fantastic. It looked like it had been carefully selected to match the food. As for the service, it was impeccable, charming and efficient. The only downside, yes there is one, is the toilet. With such fantastic décor throughout, one would expect the same would have followed in the lavatories. Well it didn’t. There was only one loo which was Unisex and it was crammed and neglected. And having only one loo on a dining floor with tables for over 60 diners, it was not suitable indeed. Will definitely come here again though. I ran out of words to express how good the food is. Do give it a try. Finally made it to Chotto Matte! I was looking forward to trying the slow cooked beef in purple potato that my friend has been raving about. We ordered few plates to share, including Asado de tira - beef , Padrón peppers glazed with miso, Nikkei sashimi with trufle oil- heaven, Sake dragon rolls and few other bits. Beef was indeed amazing and so tender you could just eat it with chopsticks, Sashimi was great too. My friend ended up ordering a dessert for my birthday and waitress brought it out with fountain candle singing happy birthday which was a really sweet touch. Downstairs bathrooms are pretty trippy, with neon walls and funky lighting- perfect for that cool gram photo. It started off quite bad with Chotto Matte but developed to a fantastic evening - as we came on Saturday late evening an unfriendly waiter advised us all tables are reserved. We left the place, complaining about the service and met the manager on our way out who apologised and invited us back in. We decided to give it another go - tried three different cocktails (i.a. Negroni and Old fashioned) and some nibbles. The cocktails and food were fabulous, and we also love the music played in the background, quite loud but just fine for Saturday night in Soho. The atmosphere is classy but funky, which how you best describe a fusion of Japanese and Peruvian food. I've visited on a number of occasions with clients at work, usually at lunchtime during the week where we have ordered A La Carte. On Saturday I attended with my girlfriend and chose the tasting menu, with numerous courses, as well as half a bottle of Prosecco and a cocktail each for £50. All the courses were delicious and cocktail very nice. We had only 90 minutes before we had to get to the show, and the waiting staff were very good at getting us our courses as soon as they could. The only reason they haven't got a 5 star from me, is that I believe the Roka Brunch offer, which is the comparison I'm working with, is slightly better value for money in terms of the variety on offer, and the ability to switch between wines when requested. Overall though, make sure you visit - the Pisco Sour is great! I didn't fall in love with Chotto Matte. I wanted to, but I just couldn't. The food was good, I can't argue with that. The sashimi platter was fresh and clean with scallop and tuna, salmon and red snapper to name a few. However, the hot dishes lacked a bit of oomph. Octopus with yuzu and purple potato whilst pretty of the plate didn't have the intensity of flavour you would expect from something chargrilled over hot coals. And, I'm sad to report, the soft shell crab wasn't as crisp as I would like. The meat didn't have that wonderful melting sweetness to it, either. I could be being over critical. I'd heard so many things that to not find every dish perfect was a bit of a let down. I'm not sure I will be going back. Awful service. Even though the food was fantastic, the service ruined the experience completely- let me add- on my birthday. Had a 9pm booking but weren't seated until after 915, even though less than half the tables were occupied. Then we coudn't order because no one attended to us. Finally took about 30mins for half the order to arrive at the table. and then another 20-25mins till the balance arrived. After we complained about a sushi plate that hadn't arrived for another 25mins, we were casually told it'll still take time so we could cancel it if we wanted. We were happily presented the bill with no compensation and the manager was incredibly rude.She claimed we weren;t exceptions and that every table had waited 30-40mins for sushi. She also said this is the case every single night, and that's how it is. Love the honesty although it speaks terribly about how they're staffed! We were finally given 10% off the bill in a huff. Shocking for a place that is quite pricey and posh from the outside. I went here for a pre-theatre meal and it is possibly the best value for money in soho. For 30 pounds (it is 25 but with service it is closer to 30) you get very well fed and a glass of procecco. The restaurant itself is buzzy and seems to draw a very chic crowd. The table behind mine was filming an instagram add campaign with influencers. I enjoyed this peruvian/japanese fusion not a combination you would think would work but it did. Would like to try again in a non pre-theatre meal setting. I came here with high expectations having read so much about it but I was a bit disappointed. Very high prices for average food. I came to the Soho branch this week to grab a late lunch with some high school friends and had the Chotto Sushi Set. This consisted of 4 pieces of salmon and avocado maki, 1 salmon nigiri, 1 tuna nigiri, 1 tamago nigiri, 1 yellowtail nigiri, 3 different side salads, and 2 ‘chocolate spring rolls’ as a small dessert. Even though this was fusion food, all the nigiri were made pretty authentically Japanese. Except perhaps their size and proportions. I found that there was slightly too much rice in each nigiri as each mouthful seemed rather large. But there was an equal amount of sashimi on top to match this so it ended up balanced. I liked each of the nigiri because they were classic types of fish you’d find on traditional nigiri. As for the salmon and avocado maki, this is also a typical combination. But the version at Chotto Matte had a sort of teriyaki sauce on it, which surprisingly went really well with this combination! I really liked it and I normally do not like teriyaki sauce. The 3 side salads were also pretty interesting. The green one was pretty Japanese in taste in my opinion, as it had Japanese seaweed and a Japanese dressing. The orange/white one was my least favourite – I didn’t like the dressing on it and it was mainly made from carrots, which I’m not a fan of when raw. The last one was a simple tomato and onion salad, which I thought was pretty refreshing. The sharpness from the raw onion contrasted well against the sweet and juicy different coloured tomatoes used. I thought the 'chocolate spring rolls' were a pretty creative and fun way to make a dessert and also a small and simple way to end the meal! Although there was a good amount of variety in the Chotto Sushi Set, it doesn’t leave you feeling very full. I was hungry about 2 hours later! But for a lunch set, it's quite reasonable for this restaurant, which is more expensive during the dinner service. The atmosphere was quite classy, with the decor and furniture used. The way the tables and chairs were laid out gave the dining area a very chill and laid back feel. Since it was lunch time, a part of the restaurant was closed off and I believe only opens up for the dinner service when the restaurant expects more customers. I was quite impressed with the bar on display – it was really pretty to have in the background and I imagine it’s more lively in the evenings. As for the service, I was slightly disappointed. Our waiter, who actually looked like the manager, as he was dressed differently to all the other waiting staff, was quite cold. When it came to taking our orders, he seemed annoyed that we had taken a while to figure out what we wanted and because we were waiting for our third friend to arrive. Then when one of my friends wanted a fork, he was about to add that my other friend wanted one too but the manager left before my friend could. So when he came back, we asked again, and he looked rather irritated that we hadn’t asked for 2 at once, but he rushed off so fast, how could we? When my friend asked for a fork the second time around, he looked at me too and simply went, “you too? ?”, which I thought was so rude! I was clearly able to use my chopsticks and was doing just that when he asked. But that wasn’t what disturbed me, it was the tone he used to ask me. I was very excited for my visit to Chotto Matte, a Japanese-Peruvian (also known as Nikkei) fusion restaurant in the heart of Soho, and I was not disappointed! The restaurant was huge with the chefs preparing and cooking the food in the middle. The decor / mural on the walls is funky and the table settings were comfortable and sophisticated. We chose the Nikkei sharing menu (£50 pp) which consisted of eight courses taken from all four cooking sections – Sushi Bar, Barbecue, Sautee and Tempura. I do love trying a bit of everything!We had the (1) Tostadita Beef, smoked aji panka, shiitake, spanish peppers (2) Warm beef fillet tataki Smoked aji panca, pear, passion fruit salsa (this was instead of the sea bass ceviche) (3) Nikkei gyoza Pork, prawn and cassava dumplings, sweet potato puree (4) Prawn spring roll, shiitake, yuzu, shiso, ponzu salsa:(5) Pollo den miso Chicken miso, carrot, daikon, yellow chilli salsa Tentaculos de pulpo (6) Octopus, yuzu, purple potato puree (7) California crab roll and (8) a trio of desserts. I was so impressed with the food – beautifully presented and really flavoursome. My favourites were the warm beef fillet, nikkei gyoza pork and the chicken miso and, not to forget, the passion fruit brulee! We polished off all of the other dishes though and were left very full and satisfied. The service was good – attentive but not pushy – and the restaurant had an air of sophistication, rather than being pretentious. Absolutely worth it for a treat on date night! Alternatively, opt for the cheaper lunchtime option with a bento box! Urban and noisy with "tapas-style" food from Peru and Japan. Those two national cuisines are closer to each other than people think. From ceviche to sushi, to great desserts, we had a great evening out and a culinary experience. The venue is modern and well presented. Service was good and attentive. I'll go back. First time to Chotto Matte, very buzzy Peruvian Japanese fusion restaurant in the heart of Soho. Great food and fun atmosphere. We had the tasting sharing menus which are the signature dishes - the miso Cod was excellent. It's not quite Roka but it's a great less expensive alternative with the Peruvian twist. Good food but the bathrooms ? : at what point doe form become facile ? Chotto Matte is the type of fusion place that brings together the best of two worlds: sushi and BBQ - what more could you ask for? The cocktails are delicious, the bento box is extremely good value and the people watching is unrivaled. It's in the center of soho which means it's not right next to any main transport lines, but don't let that stop you. Try a bit of everything, the tostadas, the bento box, the dessert! The whiskey choco dessert is basically a pot of solid chocolate, with one small fruit on top so you can feel a little "healthy". If you're hungover/don't want to have to deal with too many choices: the bento box does it all for you. If you've got more time, and energy, to choose from their full menu of delicious, you can't really go wrong. Careless service = sick for days. I've been here twice - 1st time I thought it was ok, service not great but food fine. Nothing to write about. Then I returned in a group including my husband who mentioned his severe shellfish allergy in the booking, as well as to the young, disengaged waiter. The waiter recommended a sharing plate to start so again we checked again to be sure everything would be shellfish free. Fast forward to getting the sharing plate, assured there was no shellfish, my husband takes a bite of an apparent veggie springroll-esque item and senses it's prawn... we check with the waiter who nonchalantly tells us it is indeed prawn. Disbelief. Then more as he offered to give us THAT DISH for free with barely an apology and eventually got around to getting his manager, equally unprofessional and unconcerned. They ended up giving us the whole meal free but it wasn't offered freely and that's hardly compensation for ignoring a repeated appeal with respect to a severe allergy, which they must encounter as a matter of course; making someone ill onsite plus the added humiliation that involves, the cab fare to avoid public transport then 2-3 days of sickness and pain that followed. Maybe these were a poor waiter and manager tag team but what does it say about a place when this is the quality of staff representing it? I stumbled across this place by accident and am so glad I did. The cuisine is a Japanese/ Peruvian fushion and offers a range of dishes from sushi rolls, to tempura to barbecued meats. We ordered a complete selection and it worked perfectly. Having the lighter dishes of the sashimi and sushi rolls, followed by the tempura and beef teriyaki meant that we were perfectly full but not uncomfortable. The combination of flavours were absolutely delicious and the portions of each dish were generous. We also shared a couple of desserts between us, the chocolate salted caramel fondant being a stand out for me. As heavenly as it sounds, it was a warm, soft sponge which once sliced into oozed an indulgent salted caramel sauce. What's not to like! The prices are fair and I would say the standard of the food is actually better than what the cost reflects. Always a good situation! It is the perfect 'mid-level' restaurant if you are looking for a venue to spend a special occasion but don't want to break the bank. It is far superior to the usual chains, but obviously more affordable than a lot of the other swanky options. It is also perfectly situated in the heart of Soho. I will definitely be back very soon! I recently had lunch here and was blown away by the quality of the food, portion sizes and fair price. There was only a few tables filled but the quality of the clientele was high, the service was good and the atmosphere was good. I had the Bento lunch Box for £20 and it had a taste of 6 different dishes which gave us a good broad selection of hot and cole dishes. I will definitely be back for more. Chotto Matte is a fascinating fusion of Peruvian and Japanese food. I can't say I was convinced of this strange union before I stepped in, but since trying their lunch bento sets, I'm convinced that it's one of those mixed marriages where the mums and dads disapprove of before the kids elope and create a whole new generation of beautiful biracial babies. Except in this case, these are very tasty offspring. Chotto Matte is also where I was introduced to pisco, Peru's specialty alcohol, and tried a few fascinating cocktails. Upstairs, there's a live grilling station, which will certainly impress your date should you choose to bring him/her along. It's not cheap, but you get what you pay for - a scrumptious meal with a great mix of the best of two cultures, and a beautiful, punky interior, making for an experience you won't be forgetting anytime soon. Three words - purple mash potato. And 'I love you'. Make like the soho basics and spread yourself against the luminous, fluorescent, incandescent walls of this place. Amazing restaurant! Every time I leave I want to go back and eat it all over again. I would especially recommend the tuna tostadita and the nikkei yellowtail. Both these are utterly amazing. I love Chotto Matte! I first stumbled across this little gem a couple of years back without knowing too much about it! I had some fantastic cocktails here with a friend and watched the world go by. Then went back not too long ago and had a fantastic meal. The black cod was amazing, some tasty spicy tuna rolls, the sea bass ceviche was out of this world and Tuna sashimi Tostadita was my favourite. What a fantastic combination of food! to finish it all off we had some lovely sake! The decor and surroundings of the restaurant and bar really lively and fun. But for the walk to the toilets have to be the most fun part believe it or not! The staff are really friendly and helpful. I can't wait to go back! I had a very nice time in this restaurant, it was very different from food I have tried previously but in a very positive way, everything was full of flavor, yet nothing tasted similar, which is something they seemed to be very proud about. The decor is really beautiful and I especially liked the neon mural by the bathrooms. The staff was very attentive and when they brought my friend's bday dessert out, it had her name written on it which I though was very sweet. The only reason I am not giving it 5 stars is because it is quite pricey (which is to be expected from a soho restaurant) and since it is also a bar it gets quite crowded and loud after a certain time. Despite this I would definitely recommend. I haven't been to Chotto Matte in a while. Happy to report they still got it. We were a group of 5 and ordered a massive amount of dishes to share. With the notable exception of slightly weird and mostly blunt kale rolls from the salads part of the menu (marketed as Vitamin B6 salad), all the dishes were magnificent, succulent and mouthwatering to look at. These are served in a rapid succession and in what seemed no particular order (so if you do have specific food requirements or a kid, who is very particular with her food, like we did, you might want to flag that to the waiters). My personal favourites were octopus (absolutely melt in your moth kind and served with the creamiest purple potato mash), sea bass ceviche (I suppose being a Nikkei restaurant they did have to get this one right), teriyaki yuzu salmon (a huge stab of fillet!) and black miso cod (it might be a cliche, but Nobu comes to mind, it's that good). Finally, make sure you try the desserts sharing platter. Never once before I thought of going for desserts at Chotto Matte (I don't believe Asian or Asian-fusion restaurants do particularly good desserts). Well, what did I know. Everything we tried (yuzu sorbet, creme brûlée, some kind of banana crumble come to mind) were all delicious. Chotto Matte has been hailed as the place foodies go to have fun. With promises of exceptional Nikkei cuisine alongside a buzzy party atmosphere, mostly fuelled by the loud modern eclectic music, this vast three storey restaurant is a party starter. We started our meal with spicy padron peppers, moreish sweet potato chips and canchas (corn puffs) to pick at. We then ordered a favourite of mine, the Nikkei sashimi made with yellowtail, cherry tomatoes, jalapeno, coriander and yuzu truffle soy. I also tried the sea bass ceviche served with sweet potato, Peruvian corn and a delicious zingy citrus sauce. In our selection of warm dishes, we ordered the ebi harumaki, which was composed of ponzu salsa, prawn spring roll, shiitake, and yuzu. We also tried the Nikkei sepia Calamari and Nasu miso which was a juicy vegetarian dish made of Aubergine miso, apricot, puffed soba, sesame seeds. Nikkei cuisine is trending at the moment and I’m not surprised given its focus on exceptional quality, natural ingredients and flavours and presentation. This combined with the buzzy urban ambiance that Chotto Matte offers makes it the perfect restaurant for an upbeat gathering with great food. The size of the venue and the menu at Chotto Matte is so large that they say it takes a few visits before you will really see everything that Chotto-Matte – meaning its worth going back to over and over again. I went for a business lunch so didn't have ages to look through the menu but was very pleased with the bento box that we both ended up ordering. £20 gave us an amazing selection of really delicious sashimi, miso soup, tempura and sushi. There was masses of it too! The waitress left us alone but was on hand when we needed her and, although pretty quiet, the atmosphere was good. Can't speak for the gents but the ladies loo was very complicated - a button to press to enter and then everything very dark. Apart from that it was great - would definitely go again. When I walked into this restaurant I had thoughts that it would be a nicely decorated tourist trap but boy i was wrong. The fusion of Peruvian and Japanese makes a good mix and restaurant offers a great atmosphere in Soho with tasty food. always the best service, and the staff rule! The new menu is much more veggie friendly, though is hit and miss. The main hits are the tostadas, the cassava chips and the purple potato mash. The sushi is average, though could be better. The atmosphere is great both upstairs and on the ground floor. The bathrooms are worth seeing - most interesting bathrooms I have come across in a long time! Make sure you pay with the velocity app - get £10 off per person! Awesome food. The sea bass ceviche and the short ribs are phenomenal! The sushi rolls are out of this world. Best part was our service. Our waiter was very knowledgeable. The support staff At the front door was welcoming and also friendly. A must for your London visit! The food and atmosphere at Chotto Matte are excellent, but we unfortunately had overeager waiters who twice removed food and cocktails that were clearly not finished and practised looking inconvenienced when I asked if a meal containing something I was allergic to and was not listed, could be replaced without the allergen. They obliged but when it arrived, I was advised to tell them what I was allergic to the point of reservation. I understand the logic, but it makes more sense to list all of the main ingredients on a menu and not just the first 3. Using Velocity for the £10 credit was good but it takes a while to get used to it and it took 2 diners and 2 waiters to walk us through it. I'd pay cash. I'd been looking forward to going here for a while now and I wasn't disappointed. It's a top restaurant. All the food was cooked to perfection. The fusion of Peruvian and Japanese was a new one on me and proved unlike anything I'd ever experienced. The pork belly was my favourite thing, though the beef heart ran it a close second. A real gem in the middle of Soho. Make sure you try the cocktails. It is amazing food no doubt but the service was amazing. Went there on tuesday evening and the food was served right on time and in a perfect way. What made it more better was perfect service and a very good food description and humor by indian/mexican guy with a goaty or french beard who kept on serving delicious food and making us smile. But on other side waiter who took our order i think an italian guy, had no time to talk to us. We would definitely like to come back for food and amazing time and to meet that indian-mexican guy and rest of friendly staff. Amazing food, amazing service....must check out! I cannot believe it took me so long to come here! Best restaurant I have eaten at this year, the service was excellent, the ambiance incredible, and the food to die for (***TRY THE NIKKEI SASHIMI***)! We were greeted on arrival by the beautiful hostesses and shown directly to our table. 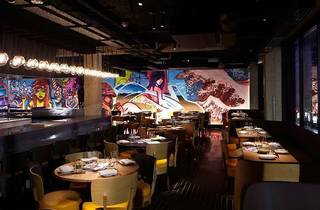 The walls are lined with edgy Japanese graffiti creating an experience unlike anything else in London. A live DJ played an eclectic mix all night to which complimented the numerous cocktails consumed by our table. I have just booked another table for Saturday coming...I cannot wait to go back. **Further update - Lost my christmas presents bag - so DON'T ever leave ANYTHING in the cloakroom** Further to my comments posted on 15/12/2013 - It was a misunderstanding in the communication and the conversation between myself and the restaurant during the course of the weekend. The General Manager has been very helpful and clarified the situation immediately, which was a big relief. Thank you. I visited Chotto Matte for the first time yesterday evening. We arrived a few minutes early for our reservation. I approached the front desk to be given a curt arrogant nod and we were completely ignored for a few minutes as if I had not spoken. I repeated that we had a reservation and the response I got was "I understand you, what is your name?" Not a good start. We were then told our table was not ready and we would have to wait a further 20 minutes. We asked if they would come and find us at the bar once our table was ready and we were told "they will try". The member of staff was not apologetic in any way. We were in the end found at the bar by a member of staff and given a complimentary drink which really did ease our frustration. However by the time we sat down we had been waiting for at least 40 minutes. We were then given menus and our waitress rushed over and asked if we were ready to order before we had even had a chance to glance at the wine list....it is not a straight forward menu. Lots of little dishes, written in Peruvian / Japanese, w weren't talked through the menu we had to ask the waitresses for recommendations. We ordered 9 small plates, we had eaten 3 of the 9 plates when we were then told by our waitress that there was "some kind of problem with one of machines in the kitchen" we waited approximately 45 minutes for the rest of our dishes to sporadically come out. We were brought up duplicates of things we had already eaten and dishes we did not order. It seemed a complete shambles. Our bill was handed to us with 3 items on it that we did not order and we again had to wait again for it to be corrected. All in all our meal took 3 and a half hours and it was not an enjoyable experience. The front of house staff were rude, the waitresses seemed stressed and confused and although I understand problems like broken machinery can't be helped we were not made to feel like the staff cared or were given any confidence that the problem in the kitchen was being rectified in a timely manner. On a positive the food was beautiful and delicious but I will certainly not be returning as it seems the Chotto Matte attitude is you should feel privileged to have a table, rather than welcome and how can we make your experience an enjoyable one. "Correctly made ceviche with Jalapeño", yeah right. Seriously, who writes these articles... Jalapeños are centroamerican, Mexican. And ceviches are from southamerica, as a matter of fact ceviche is a typical dish from countries from this region with a pacific coast, Colombia, Ecuador, Peru and Chile. A correctly made Peruvian ceviche would have Rocoto, not jalapeño (the difference is huge). Each country has its own interpretation of the dish, but the principle is the same, raw sea food marinated in different citron juices (Ecuadorians use oranges for instance) local ingredients, and local aji (hot peppers) so there's not such thing as a correctly made ceviche to start with, and there's not such thing as a ceviche with jalapeño, as jalapeños are not a locally grown in southamerica. We arrived there totally by chance, but there is not enough words to describe what a great time I had with my friends. Firstly, a very pleasant atmosphere with interesting design and separated dining&lounge areas. Another great thing about this place is service. Everyone is smiling and helpful. We personally would like to thank to Sadie who was amazing and super cool. Definitely will be back there.